Our highly experienced team consists of nationally certified diabetes educators, including nurse educators and registered dietitians. You will meet with them to develop a personalized plan to manage your diabetes on a daily basis, and to gain the knowledge and problem solving and coping skills needed to successfully manage the disease and prevent complications. To develop the individualized plan of care that will best meet your needs, our certified diabetes nurse educator, certified diabetes dietitian and the rest of the diabetes management team collaborates with your primary care provider or endocrinologist. We offer individual and group appointments that cover a broad range of treatment and education components. Download a printable pdf of the Center for Diabetes Management brochure. Diabetes is a disease that causes the body to not produce or properly use insulin. It is the most rapidly growing chronic disease, impacting one out of every 12 adult New Yorkers. There are more than 21,000 adults diagnosed with diabetes in Dutchess County alone, and the disease often goes undiagnosed, as the symptoms can be overlooked or misunderstood. If you have any questions about these symptoms, it is important to contact your doctor. Using a non-judgmental, respectful approach, our team’s primary objective is to help you learn the skills required to manage your diabetes and reduce the risk of developing complications. Knowledge is power, and our team will educate you so you can take control of your diabetes. We provide you with the tools, skills and support to be successful in leading a healthy life. 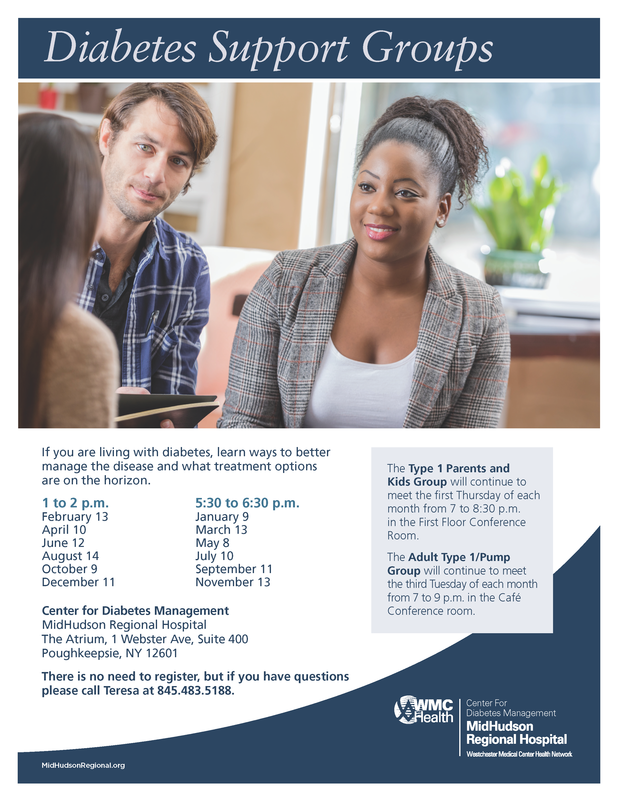 The Center for Diabetes Management offers support group meetings at convenient times at MidHudson Regional Hospital in Poughkeepsie. The Adult Diabetes Support Group at MidHudson Regional Hospital is led by a diabetes educator and includes guest speakers at select meetings. The support group meets on the second Wednesday of every month and alternates each month between a day group from 1 to 2 p.m. and an evening group from 5:30 to 6:30 p.m. Please view the below flyer for our 2019 dates. The Adult Type 1/Pump Support Group is peer-led and meets on the third Tuesday of each month from 7 to 9 p.m. in the Café Conference Room. The Type 1 Parents and Kids Support Group is parent-led, with activities provided for children separately from the parent meeting. This support group meets on the first Thursday of each month 7 to 8:30 p.m. in the First Floor Conference Room. There is no need to register for our support groups, but if you have questions please call 845.483.5188. MidHudson Regional Hospital accepts resealed, hard-sided plastic containers at no charge, 24 hours per day, 7 days per week, in the emergency department. Please visit the security officer in the emergency department or call the Resource Center at 845.431.8225 for details.